Music genre — or simply genre — refers to styles of music. "Rock" is a music genre, as our country, reggae, classical, jazz among others. When talking about genre in the music industry, it is helpful to think in terms of top-level genres and sub-genres. Take, for instance, the genre of rock. Rock is a very broad term that encompasses many different types of music, some of which are actually pretty divergent from one another. 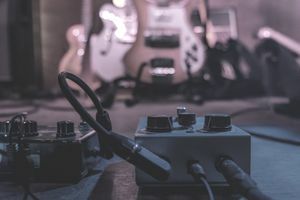 Punk, indie, shoegaze, AOR, metal and many, many, more all fall under the top level genre category of rock but can each be considered individual sub-genres. This sub-genre category is usually more useful in terms of describing music to another person. For instance, telling someone that a band is a rock band is not as helpful in describing the sound as saying the band is a punk band (the description of "punk" is more useful in telling someone what an artist sounds like). For Descriptive Purposes: The ability to be as descriptive as possible about someone's music is a great tool for a number of different musical careers. Whether you're a manager trying to convince someone to listen to your artists' music, a PR person trying to sell a magazine on a review, a radio plugger trying to land some plays for an artists or a booking agent trying to get a band a show, being able to give some musical points of reference in the form of a genre description is critical. Understanding the Audience: Understanding genre is also key to understanding audiences. Genres — or more specifically, sub-genres — tend to have a culture all their own. Fans of a particular sub-genre of music may tend to flock to the same kinds of venues and same kinds of shops, listen to the same radio stations, watch the same movies and use the same websites. This kind of information is invaluable when it comes to promoting and marketing music and putting together live shows. If you're in or representing, say, a punk band (which is a sub-genre with a very clearly defined culture of its own), then you can increase your chances of success by understanding where punks fans go for their music in any given area. It will help you reach the right listeners every time, increasing your chances of success. In fact, understanding the identity of a sub-genre can even help direct the design of your cover art and merchandise — or dictate whether you need these things at all. Affects Decision Making: Identifying genre will also help musicians and their representatives choose the right labels to approach with their music and can even help them decide if they need a label at all. Whereas music in the pop genre benefits from having a major label behind it, indie rock can thrive on an indie imprint — and can be self-released much easier than a record by an unknown pop artist. A genre is a key to unlocking lost avenues for music industry success, so resist the urge to shrug it off as a meaningless label — it really is an important part of communicating your music to the masses.